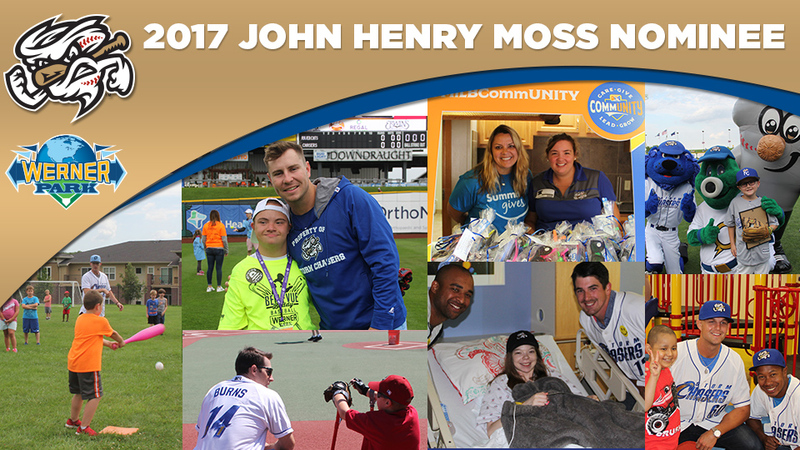 The Pacific Coast League has announced that the Omaha Storm Chasers' franchise is the circuit's nominee for Minor League Baseball's John Henry Moss Community Service Award. Each league in Minor League Baseball nominated an organization, with the overall winner announced at the annual Baseball Winter Meetings in Orlando, Florida in December. "A truly great organization is one that shows a high level of commitment to its own community," stated Omaha Storm Chasers President and General Manager Martie Cordaro. "We are proud to be representing the Pacific Coast League with this nomination, which is a testament to the time and commitment of our front office staff, as well as the Kansas City Royals organization, to the Omaha Metro community." Over the course of the 2017 campaign, Chasers Charities, the charitable arm of the Omaha Storm Chasers, donated $808,182 to local charities, setting an all-time record in charitable giving for the fourth consecutive year. The Storm Chasers assisted over 1,500 different organizations, and were also visible in the community with over 420 mascot and player appearances. Front office employees also donated 740 hours of community service throughout the year. 73 different organizations were provided a platform at Werner Park at the Sprint Community Organization of the Night. Over $18,000 was raised through the McDonald's and Huber Chevrolet Hurl the Pearl promotion for the Ronald McDonald House, while more than $21,000 was raised for various local charities including Methodist Hospital Founation and Moving Veterans Forward via four Jersey Auctions. Initiatives also included Hy-Vee Canned Food Sundays, with nearly 5,000 items donated to Heartland Hope Mission, in addition to Chasers FUNdamentals, with Chasers Charities teaming with DREAM to put on baseball clinics introducing youth to baseball. Chasers Charities also offered the Chasin' Dreams Grant, donating a total in excess of $9,000 to help non-profit organizations that operate youth softball/baseball programs make major renovations. Two Jackie Robinson Athletic Scholarships worth $1,000 each were also awarded through Chasers Charities and The Weitz Company, while partnering with the Nebraska State Treasurer's Office for the 15th annual Why I Want To Go To College Essay Contest. The Storm Chasers also held their third annual Chasers Community Week presented by Summit Dental, which included the Jirschele Family Memorial Golf Outing to help benfit the Muscular Dystrophy Association, as well as player appearances at Children's Hospital and the Southwest YMCA and hosting Bellevue Buddy Baseball at Werner Park. The nine-day event culminated in hosting The Wall That Heals, an exhibit that featured a half-scale replica of the Vietnam Veterans Memorial Wall in Washington D.C. The exhibit was open 24 hours a day from August 3-6 at Werner Park, with the Storm Chasers' Military Appreciation game preceded the exhibit's closing ceremonies. Werner Park also served as a site for local organizations to use the stadium as a venue to host large-scale fundraisers. Those special events included the "Boxer 500" to benefit the Great Plains Colon Cancer Task Force, the "Walk to Defeat ALS", SHARP Race towards Brain Aneurysm, Heart Heroes Run, and Nebraska 9/11 Memorial Stair Climb.